The readings for this Sunday focus our attention on the promise of new life in the resurrection. In our first reading (Ezekiel 37:12-14), we hear God's promise to the Israelites who were still in captivity in Babylon. This is both a promise of the restoration of Jerusalem after their exile and also the "new Jerusalem" when in the final days, God will raise all the faithful to new life. Thus says the Lord GOD: O my people, I will open your graves and have you rise from them, and bring you back to the land of Israel. Then you shall know that I am the LORD, when I open your graves and have you rise from them, O my people! I will put my spirit in you that you may live, and I will settle you upon your land; thus you shall know that I am the LORD. I have promised, and I will do it, says the LORD. In our Gospel reading (John 1:1-45), we hear of Jesus raising his friend Lazarus from the dead. Jesus did this "so that the crowd may believe that you (the Father) sent me". The sisters of Lazarus sent word to Jesus, saying, "Master, the one you love is ill." When Jesus heard this he said, "This illness is not to end in death, but is for the glory of God, that the Son of God may be glorified through it." Now Jesus loved Martha and her sister and Lazarus. So when he heard that he was ill, he remained for two days in the place where he was. Then after this he said to his disciples, "Let us go back to Judea." When Jesus arrived, he found that Lazarus had already been in the tomb for four days. When Martha heard that Jesus was coming, she went to meet him; but Mary sat at home. Martha said to Jesus, "Lord, if you had been here, my brother would not have died. But even now I know that whatever you ask of God, God will give you." Jesus said to her, "Your brother will rise." Martha said, "I know he will rise, in the resurrection on the last day." Jesus told her, "I am the resurrection and the life; whoever believes in me, even if he dies, will live, and everyone who lives and believes in me will never die. Do you believe this?" She said to him, "Yes, Lord. I have come to believe that you are the Christ, the Son of God, the one who is coming into the world." He became perturbed and deeply troubled, and said, "Where have you laid him?" They said to him, "Sir, come and see." And Jesus wept. So the Jews said, "See how he loved him." But some of them said, Could not the one who opened the eyes of the blind man have done something so that this man would not have died?" So Jesus, perturbed again, came to the tomb. It was a cave, and a stone lay across it. Jesus said, "Take away the stone." Martha, the dead man's sister, said to him, "Lord, by now there will be a stench; he has been dead for four days." Jesus said to her, "Did I not tell you that if you believe you will see the glory of God?" So they took away the stone. And Jesus raised his eyes and said, "Father, I thank you for hearing me. I know that you always hear me; but because of the crowd here I have said this, that they may believe that you sent me." 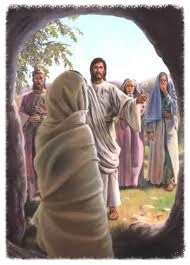 And when he had said this, He cried out in a loud voice, "Lazarus, come out!" The dead man came out, tied hand and foot with burial bands, and his face was wrapped in a cloth. So Jesus said to them, "Untie him and let him go." Now many of the Jews who had come to Mary and seen what he had done began to believe in him. In our Epistle reading (Romans 8:8-11), St. Paul draws a sharp contrast between those who live in Christ and those who are still "in the flesh". For those believers who are living "in the Spirit", they will know the resurrection through the Spirit. Brothers and sisters: Those who are in the flesh cannot please God. But you are not in the flesh; on the contrary, you are in the spirit, if only the Spirit of God dwells in you. Whoever does not have the Spirit of Christ does not belong to him. But if Christ is in you, although the body is dead because of sin, the spirit is alive because of righteousness. If the Spirit of the one who raised Jesus from the dead dwells in you, the one who raised Christ from the dead will give life to your mortal bodies also, through his Spirit dwelling in you. Today, we see evidence that Jesus is the fulfillment of the promise of God to the Israelites in captivity. We know, that in Christ, our bodies will be glorified even though we die, as Christ is glorified even though he has died.